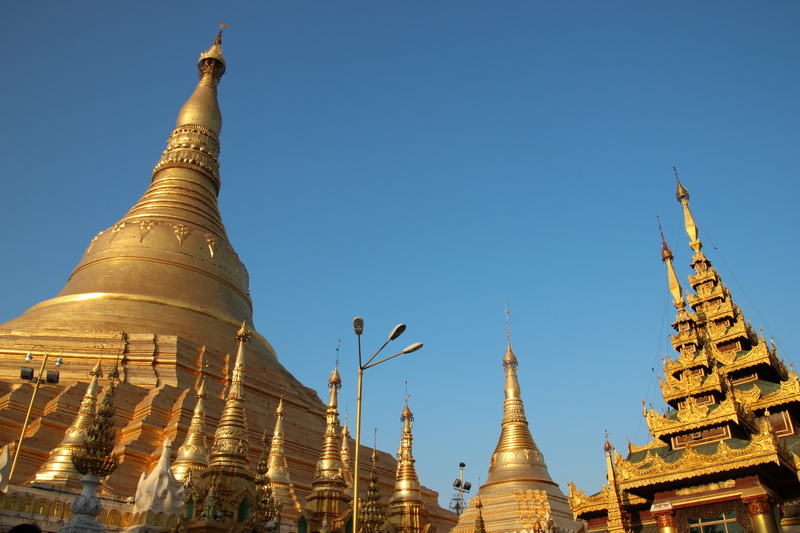 Our first view of Burma was, perhaps inevitably, of a pagoda. As the plane started its descent into Yangon airport we realised we’d got our timing perfect: sunset lit up what seemed to be miles upon miles of empty golden plains, scattered only it seemed with the occasional conical towers (or stupas) of pagodas, lit up by the last rays of the day. It definitely wouldn’t be the last one we’d see, and whilst pagodas and temples have to be pretty near the top of any traveller’s list whilst visiting this country, for me one of the most important aspects of coming to Burma is the fact that it is where my Dad was born. 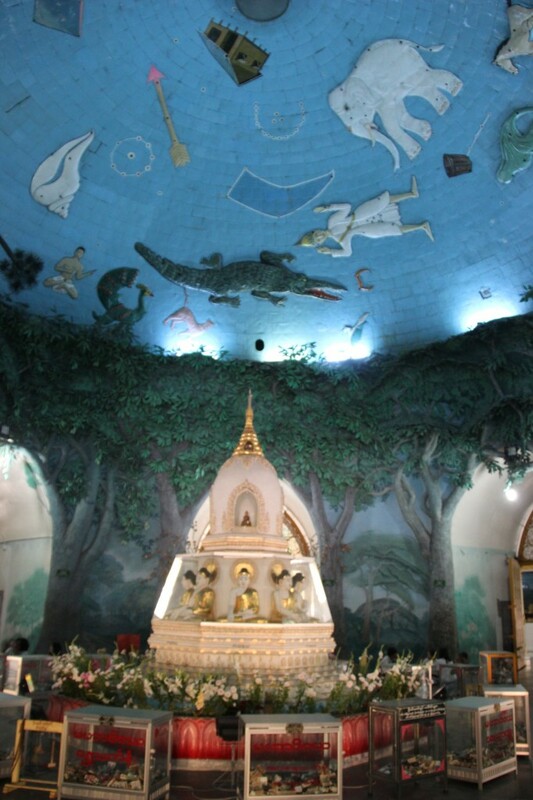 I’ve been hearing about it since I was little, and for me Burma has always conjured up evocative images of exoticism and, until quite recently, has seemed very far away and inaccessible. In fact it has only been in the last few years that travel to Burma has ‘opened up’ to the West, and even more recently that the western media has dropped its message for tourists to ‘stay away’, lest we inadvertently encourage a continuing political corruption of human rights. Tourists are still, however, actively urged to travel responsibly, and most importantly to try not to send too much money directly into the government’s pocket. To this end we decided to take our chances and travel independently around the country (rather than booking on to a group tour as we’d first thought to do when looking at Burma) and to try to use local services as often as possible (although we will have to take the train on longer, across country trips, when necessary). 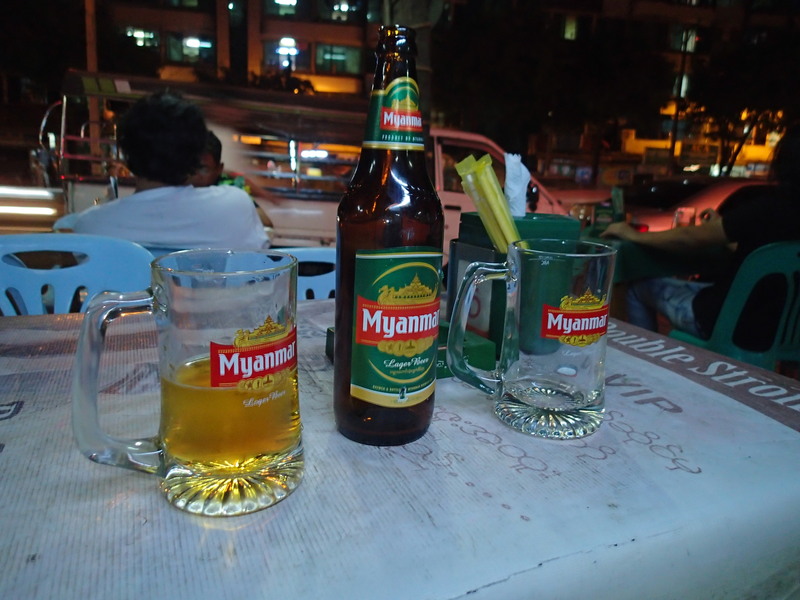 So far so good, as our first stop, Yangon (or Rangoon, as many still call it) has been a fantastic experience. Our first evening in the city couldn’t have been more welcoming. Within 2 minutes of getting into our cab at the airport our taxi driver, Minmin, had already expressed his love of Liverpool FC over Arsenal and within another 5 minutes had agreed to show us around the city for the whole of the next day. 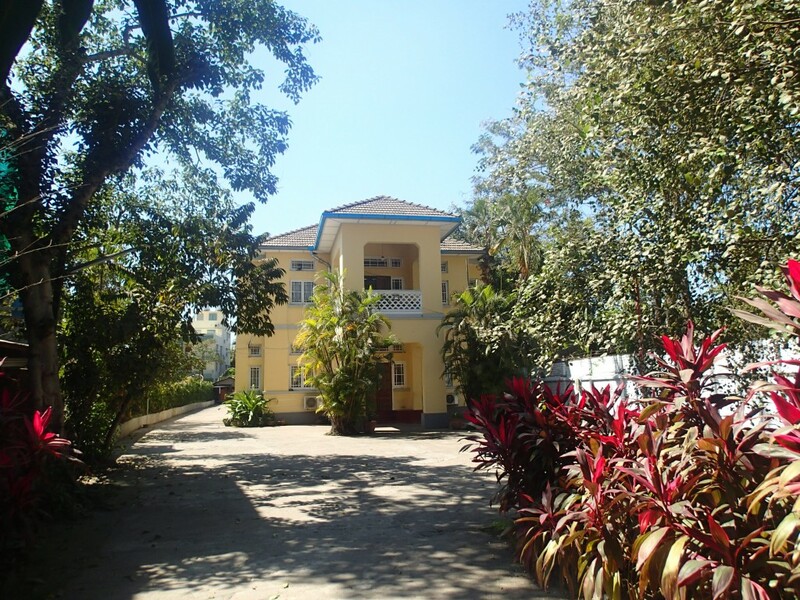 Arrangements made and dropped off at the hotel, we were met with the perhaps the sweetest family of hoteliers of our trip, who welcomed us into the Golden Guest Inn on Insein Road. The guest house itself was possibly stuck in a timewarp from the 50s (as it seems are many places over here) but it did have air conditioning and, more importantly, bloody good breakfasts. The universal ordering of a beer seems to work pretty much anywhere so even though none of the staff at the street bar we sat down at could speak English we were pretty successful anyway, and everyone smiled lots to make up for the absence of a mutual vocabulary. 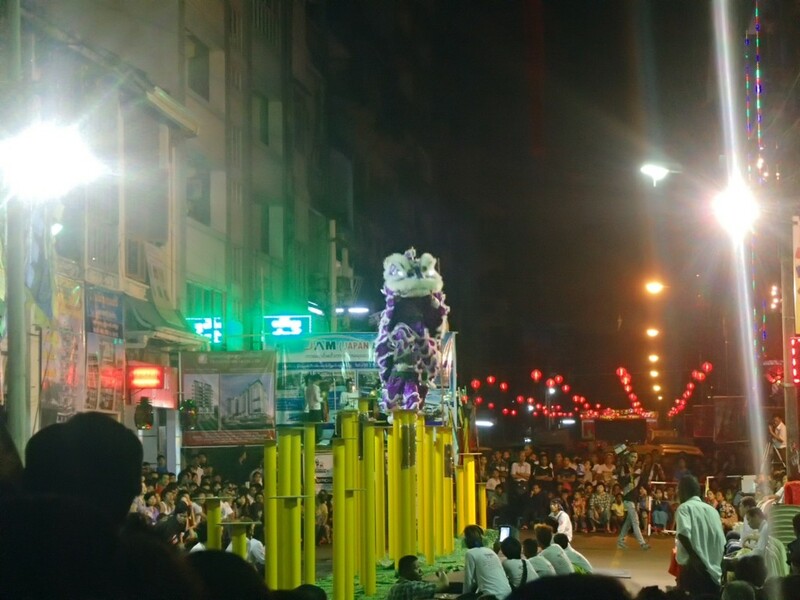 From our spot on the pavement we were able to watch some Chinese New Year dragon dancing celebrations, which sounded and looked fantastic. 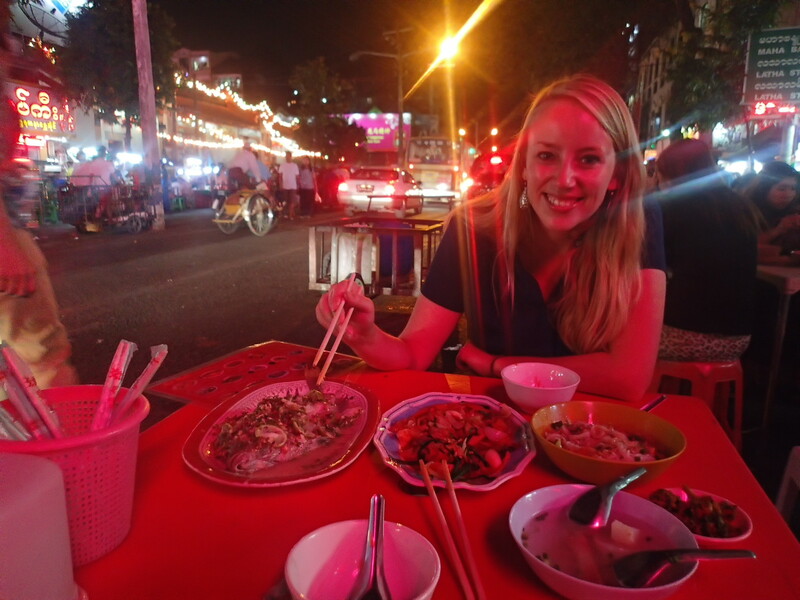 Buoyed by our lovely welcome and a couple of pints of Myanmar draft we headed further down the road for a fantastic meal of fried chicken noodles. The owner of this place spoke a bit of English so we were able to write down a few phrases with his help, until a fight broke out in the bar and he had to leave us sharpish. The next day, set up by that lovely breakfast, we set off at 9 am for a tour of the city with Minmin. This entailed A LOT of pagodas. That said, they were all fairly unique in character, and definitely got increasingly more impressive as the day progressed. One of the many pagodas - no other tourists in sight! What we both found most incredible about all the pagodas/temples was the magnitude of wealth that go into the maintenance and appearance of them year on year. In a country that sits just above the poverty line, the pagodas are bejewelled in precious gems and covered in literally tons of gold leaf. It is obvious that ordinary people place great importance on their faith – unlike other temples we have seen in Asia the ratio of tourists to local people visiting them is virtually non-existent, and they clearly donate what little they have to the upkeep of the temples – but what makes somewhat uncomfortable viewing is the sheer scale of donations from the incredibly rich and powerful minority of Burma, and we’re talking military generals here. This aside, the pagodas are incredibly beautiful, and some contain remarkable features such as HUGE Buddhas (reclining and sitting) and a ceiling mural of the constellations of the sky. As well as looking around these, we also took a visit to a moveable market (in a boat) that was moored up in the docks. We were able to take a look around the boat which, as well as serving as a hub for trade, is the living space of the communities that work and permanently stay on the boats. 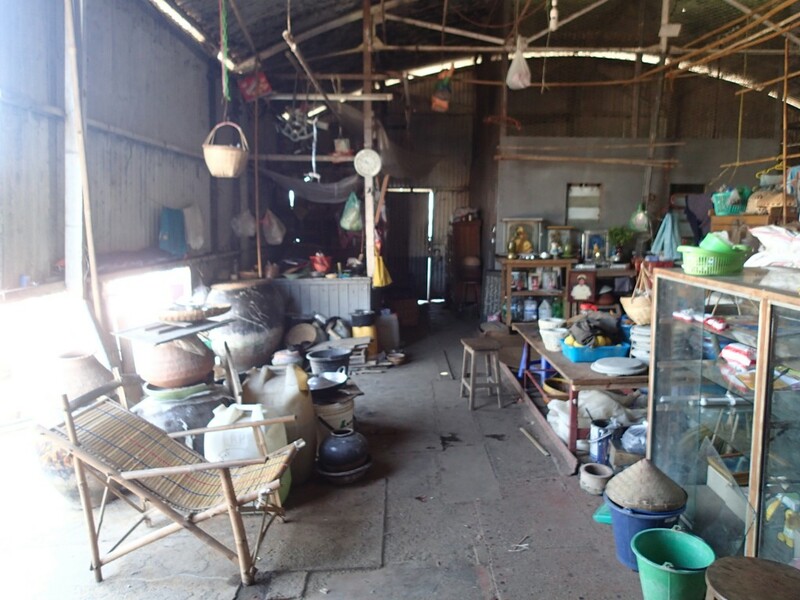 This living space more than anything we’d seen so far showed us how little the country has been opened up to the rest of the world, with all its modern amenities, for the last 50 years or so. 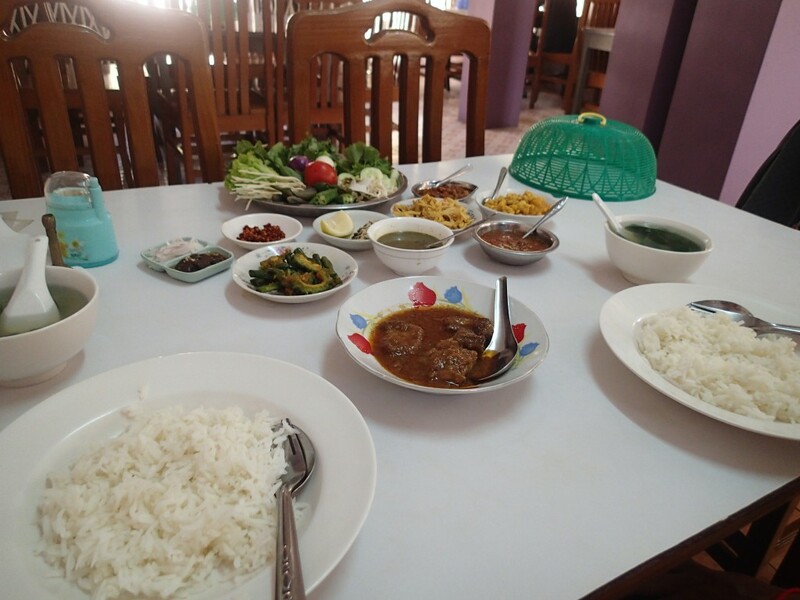 We had a Myanmar-style lunch in a restaurant owned by a man who until recently had been held as a political prisoner for around 17 years. 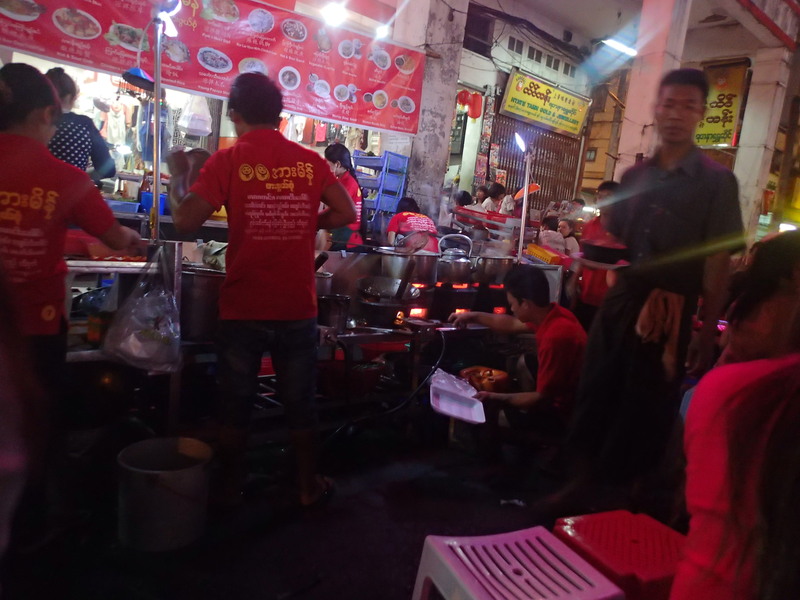 The food was delicious, and although we had no hope of identifying the endless side dishes that kept appearing (many were spicy lentil based – lovely) we can very much recommend what was described on the menu as ‘chicken in a thick brown sauce’. After lunch was the moment I’d been waiting for. 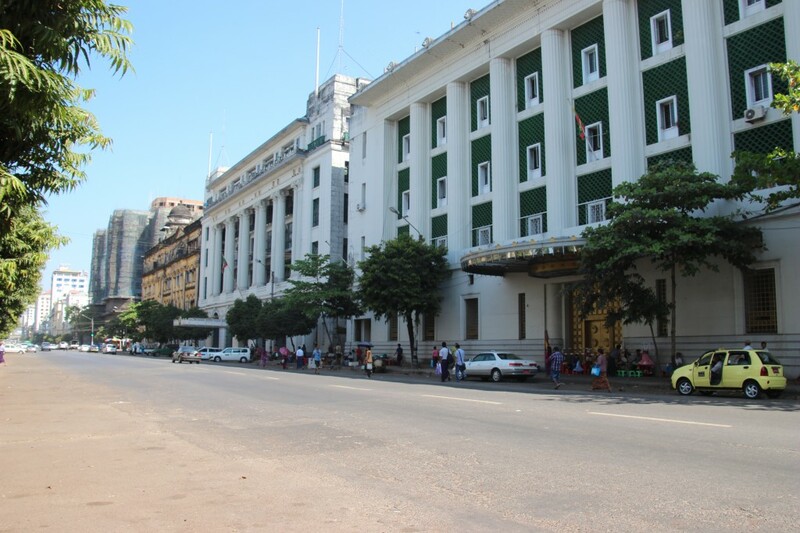 The address of the house in which my Dad lived with my Grandparents for the first few years of his life (my Grandpa worked at Grindlay’s Bank in Rangoon) is 51B University Avenue Road, and we’d worked out that this was a few doors away from Aung San Suu Kyi’s house at No. 54. Knowing that no tour of Yangon is complete without a stop outside her gates, we had no problems in asking Minmin to hang about whilst we made our own trip to my Dad’s old house. 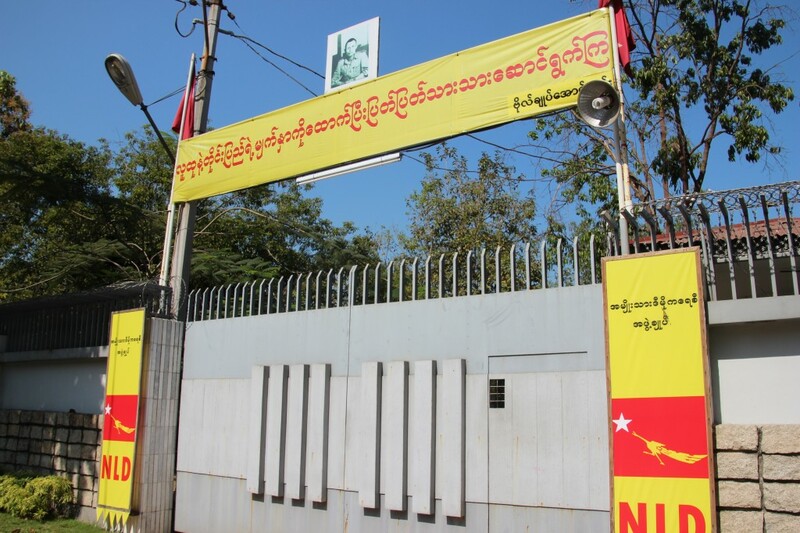 Firstly though, a short history lesson: we did of course make a stop at the very significant house in which Aung San Suu Kyi was kept under house arrest for 15 out of the 21 years between 1989 and her final release in 2010. As the daughter of the much loved ‘general’ Aung San, who negotiated Burma’s independence from us Brits in 1947 and who was assassinated by his rivals in the same year; Aung San Suu Kyi is the opposition leader and the chairperson for the National League of Democracy in Burma, and is very much seen as a figure of hope and reverence amongst the Burmese people. 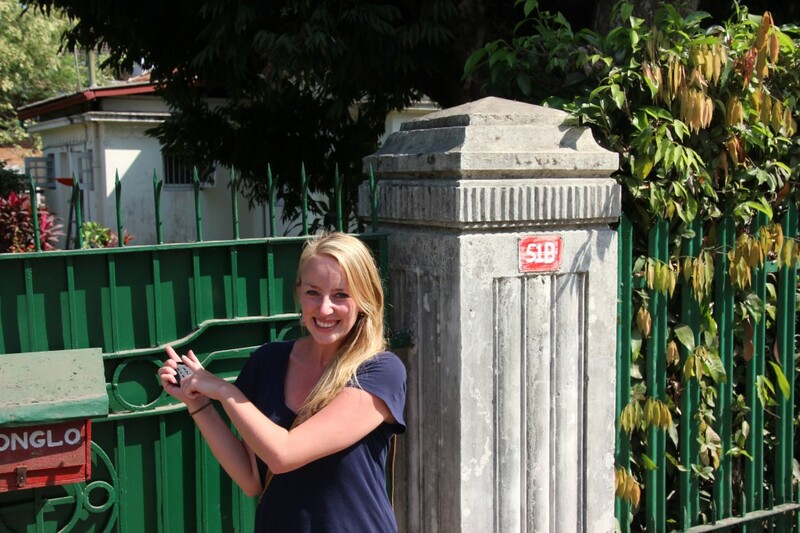 It felt like quite an honour to be standing before her gates (even though we couldn’t really see the house at all!). Across the road from the gates of No. 54 is a small private road where No. 51B stands. We were able to peek over the gates and take a look at the house. It felt really special, and rather surreal, to finally be there (even ripping a huge hole in the backside of my trousers didn’t ruin the moment). We then headed to the Bogyoke Aung San Market, a sprawling warren of interesting stalls selling everything from food to gold, puppetry, jade, and silk. Our first stop had to be a clothes stall so that I could buy a Myanmar style skirt and shred my obscene trousers, but after that we had a bit of a look round and some freshly squeezed orange juice from one of the stalls outside. We then had another half an hour of wandering round trying to find where Minmin had parked (it turned out, right where he’d dropped us off) that made us nice and sweaty for our final pagodas of the day. 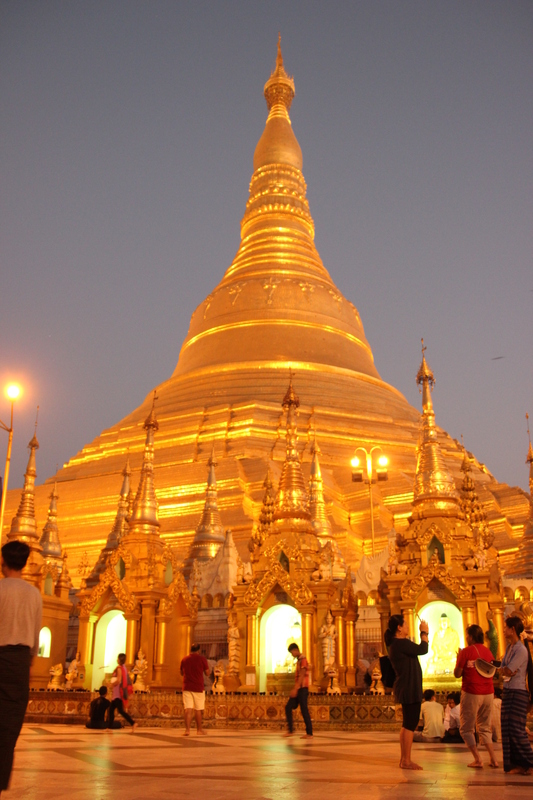 We finished the day with the second of our Burmese sunsets, this time at the incredibly grand Shwedagon Pagoda. 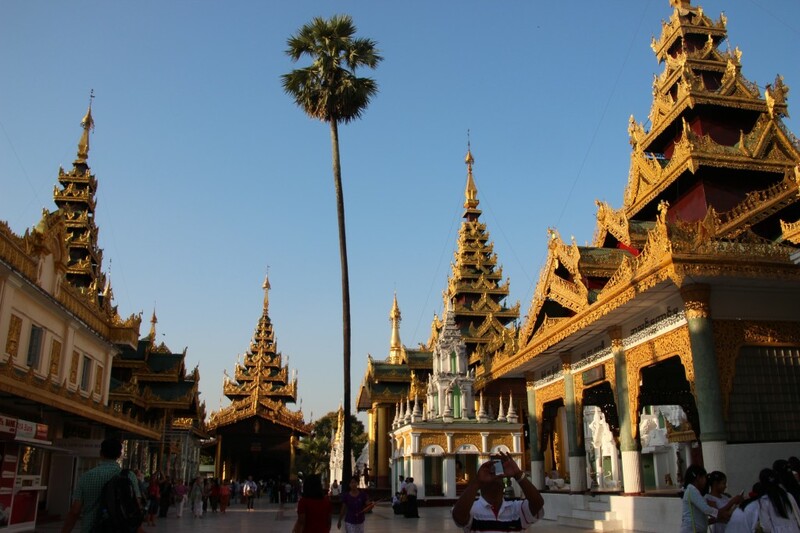 At 2,500 years old, this is Yangon’s most famous pagoda (it also holds 4 relics of Buddha such as his hair and teeth) and as such was the first time we really encountered any other tourists en masse. We stayed as the light changed from early evening to sunset to dark and were rewarded with some amazing changing views as the golden stupa was hit by the light in different ways. A great end to our first day. Phew, can’t believe all that was just the first day – I am rattling on. Part of our second day was spent organising train tickets, which was an experience in itself. After lots of walking about to find somewhere that would change our Burmese currency back into US dollars (and only crisp new ones – nobody over here accepts notes with even the slightest of blemishes or folds) we finally found the booking office for the train station (not in the train station), which at first glance kind of looks like a big cattle auction mart with steel pens, but helpful staff soon reassuringly send you along the correct steel pen to the relevant ticket window. We came away with two handwritten tickets (the ticketing isn’t computerised in Burma so all our details were written up into a big ledger) for the sleeper train to Mandalay the following day. Job done. 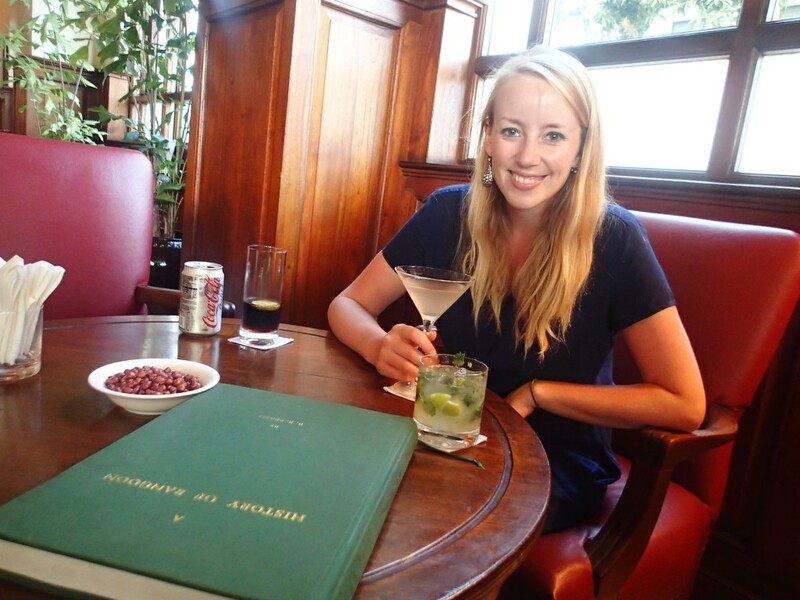 The rest of the day was spent with more walking / sightseeing around the city and a relaxing read in Independence Park, before a cocktail in the bar at The Strand hotel, which is rather shabby chic now but once served the likes of George Orwell and Somerset Maugham. As much as I enjoyed my Lemongrass Martini, old style glam is really not so much our style (or covered by our budget) so we then headed for dinner downtown in Chinatown. Chinatown was alive with celebrations for Chinese New Year, so we joined the crowds to watch a daring feat of dragon dancing on poles (lots of drum rolls and cymbals clashing) before tucking into a gorgeous dinner of fish cooked in lime, roast neck of pork and shan-style noodles (all for about £4) in one of the street-side eating places. We realised how much we should appreciate amazing meals like this when, as soon as we’d finished, an old man who’d been quietly standing by as we ate suddenly produced a plastic bag and politely motioned if he could take the remains of our meal. 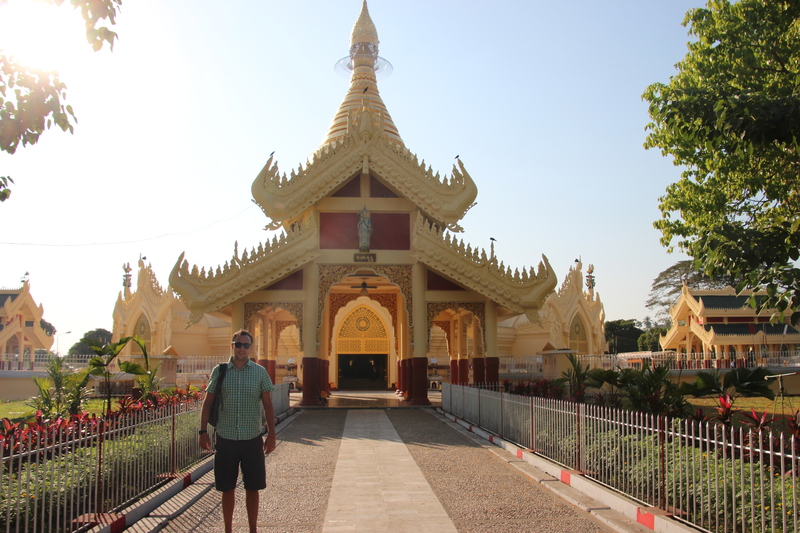 And so pretty much ended our first trip to Rangoon. In just a couple of days I feel like we were a lot more at home here than we have been in many places where we’ve stayed for much longer. The welcome of the people was a huge factor in this, and it is also a beautiful city; the peeling grandeur of the old colonial buildings contrasting the shiny golden glows of numerous pagoda stupas, as well as the colour found everywhere from green mango stalls to the sandalwood face paint people wear (against the sun and mosquitos), to the red teeth of the betel chewing taxi drivers. A fantastic place. We look forward to returning on our way back! BREAKING BAD UPDATE: Series 3, episode 9. 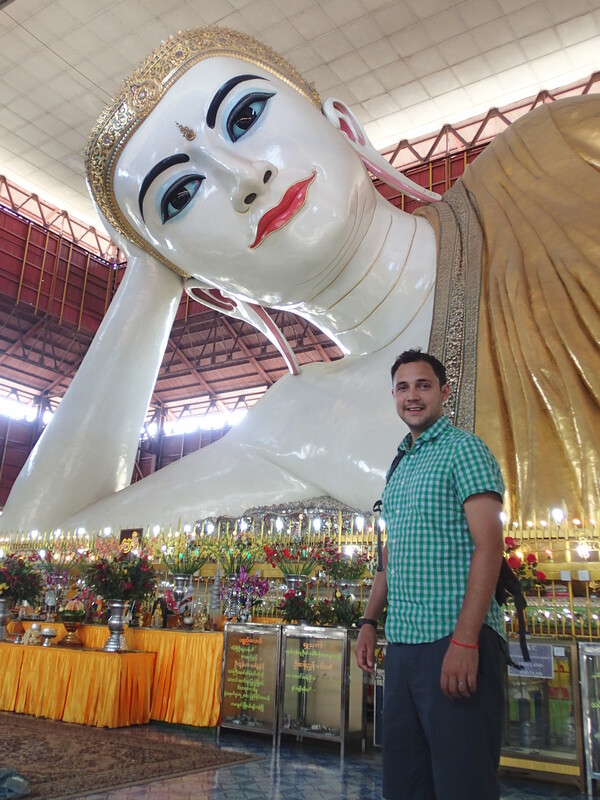 One Response to "We finally arrive in Burma! 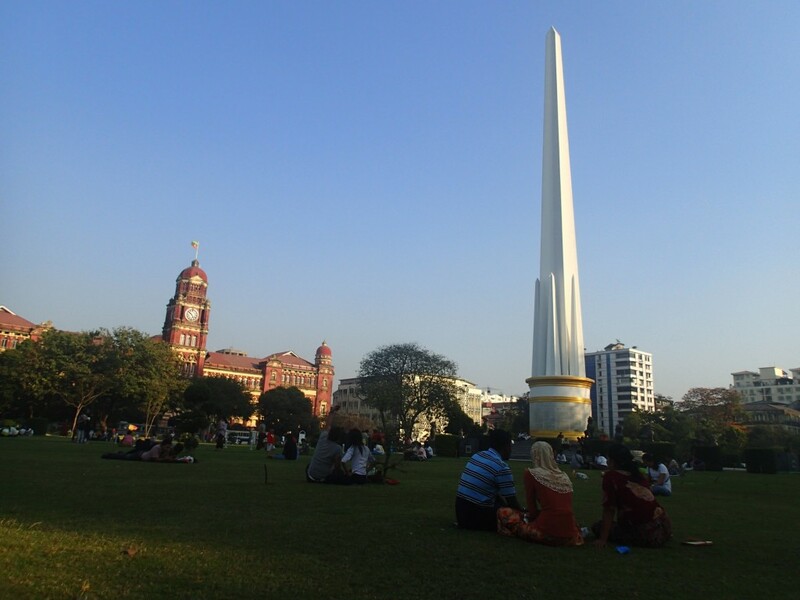 First stop: Yangon / Rangoon"